Alaattin Duran, the dean of Cerrahpasa Faculty of Medicine, was removed from his job several hours after Republican People’s Party (CHP) presidential candidate Muharrem İnce paid a visit to the faculty’s campus on Thursday. 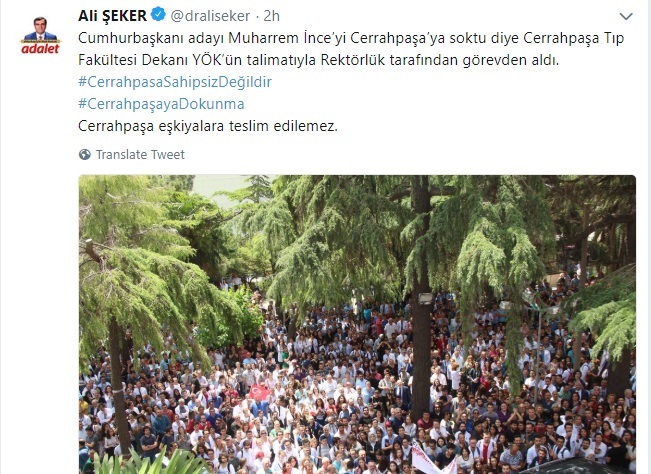 İnce held a public demonstration at the Cerrahpasa campus early on May 24, and vowed to abolish a government-sponsored law to establish 20 new universities across Turkey while dividing some of the existing universities. Hundreds of students, academics and personnel attended the meeting, the Turkish media reported. Among the universities determined to be divided are İstanbul University, Gazi University, Sakarya University, Anadolu University, Süleyman Demirel University and Afyon Kocatepe University. For weeks, university students and academics around Turkey have been protesting the government’s bill to split up 10 universities, including the historic Istanbul University. Last month, Proffesor Mert Savrun, vice rector of Istanbul University and a faculty member of the Cerrahpaşa School of Medicine, resigned from his post in protest of the proposed legislation.